American Thanksgiving. It's all about the big bird. Or is it? Every year it's the same thing: Cooks everywhere spend countless hours debating the merits of free-range, organic, grass fed, wild, and frozen turkeys. Then when they finally decide on a turkey, they spend even more hours debating how to cook it: Will brining make the meat succulent? Should it be basted every hour? And what about the stuffing? Every family has that relative who insists on stuffing the turkey. So should you stuff the turkey and risk salmonella poisoning for your guests or incur your Aunt Edna's wrath? These are not easy questions. That is why my favorite part of Thanksgiving has always been the side dishes. You know them-- the perennial favorites such as cranberry sauce, sweet potatoes, winter squash, string beans, and Brussels sprouts. Probably like most of you who celebrate Thanksgiving, I expect these dishes to grace the Thanksgiving table every year, but sometimes they need a little spicing up. Starting today, and for the next four weeks, I will share a recipe for a favorite Thanksgiving side dish with a twist. Think of it as your old favorites going for a make-over; they'll still be your favorites but only better. Rather than traditional butter, brown sugar, and cinnamon, this acorn squash has some Latin flare. 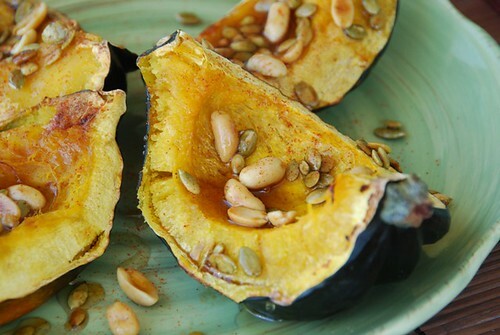 A tangy, spicy lime and honey glaze contrasts deliciously with naturally sweet acorn squash, while peanuts and pepitas add earthiness and crunch. This sauce also works wonderfully on butternut squash and sweet potatoes. As for all those questions regarding turkeys, just call one of the dozen or so turkey hotlines that are there to help you with your bird. But really, how much turkey talk can one take? Preheat oven to 400 degrees F. Line a baking pan with tinfoil (for easy clean up). Brush the flesh of the squash with olive oil and roast flesh side down for 40-45 minutes, or until tender. In a small skillet over medium heat, add peanuts and pepitas. Heat until golden brown and they begin to pop. Remove from heat. In a small bowl, combine lime juice, lime zest, honey, water, vinegar, cayenne pepper, cumin, and salt. Whisk until smooth. Just before you're ready to serve the squash, add the sauce to the pan of toasted peanuts and pepitas. Heat on medium until the sauce begins to bubble and becomes syrupy, about 2 minutes. Remove from heat and drizzle over the cooked squash. Serve immediately. **Pepitas is the Spanish name for pumpkin seeds and are used often if Mexican food. They're available at Mexican markets, specialty markets such as Whole Foods, and many supermarkets. Pumpkin or sunflower seeds make good substitutes. I'm sending my acorn squash to Jeanne of Cook Sister who has chosen for the love of gourd for this month's WTSIM. Oh goodness, those are some stressful choices indeed! I'm glad I don't have to think about them for a while ;) I'm sure, though, that some magazine like Cook's Ill or Martha Stewart has the answers :) I love side dishes too, especially ones that combine sweet and savory, such as your squash beauties! I've never had acorn squash but I love pumpin, butternut and spaghetti! Pioneer Woman has a great acorn squash recipe the other day too! Your Butternut Squash risotto sounds fabulous. I have never made risotto before it those flavors sound like they'd complement each other very nicely. Woo-hoo! Thanks for this. I've got two acorn squash sitting on my kitchen table right now and I've been wavering in indecision about how to do them up. Decision made! Looks amazing! 'Tis the season for squash, and I love this Latin flavors. Can't wait to try it! Sounds great! As soon as the WHB festivities are over I'm going to be doing Thanksgiving recipes too! Tis the season for it. We don't have the same tradition of Thanksgiving but if we would I'm sure I would focus more on the side dishes than the turkey. Eating a lot of squash over here at the moment. But that galze is a new one on me - sounds funky and tasty! Oh goodness Thank you Susan. This looks like wonderful acorn squash, on that will become a dish of tradition that people ask for again an again. We need to have this one tonight. A great idea! Really delicious and totally seasonal! I love Thanksgiving side dishes the best as well. I make huge leftover plates of just them, sans turkey, for days following the big event. And I never thought of the whole salmonella thing with the stuffing - eww!! Yum! I had acorn squash last night and roasted the seeds. I hate throwing anything away and they are so tasty! Cute idea. The squash look delicious and sound so tasty. Great side dish that I will have to try. honey-lime glazed? Really - wow! 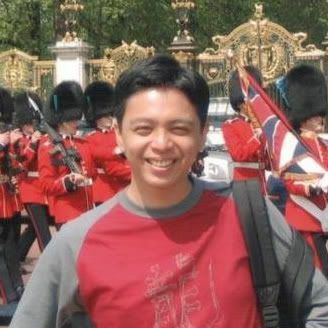 mark-I love the combo of sweet and savory flavors in so many types of dishes. kalyn-I'll look forward to them! 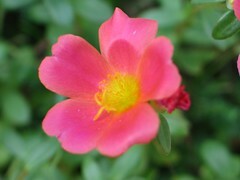 joey-Thank you so much, my dear. linda-The sides are the way to go. tanna-I hope it becomes a staple! culinarywannabe-Yeah, it's pretty gross but apparently happens. rachel-I love roasted seeds, esp with coarse sea salt and chili powder. debbie-I'm glad you like it. I love how a simple slice of squash is the best way possible to present the ingredient...the taste would however come from you! I make a similar recipe, but with pistachios instead of pepitas! This is a nice turkey day side dish. And sprinkle with pepitas (isn't this name adorable? ), even better! Acorn squash is among my very favorite fall things. Love the addition of the pepitas. Nice twist. I'll be interested to see your ideas for the side dishes. You mean I have to put my Halloween recipes away and start thinking about Thanksgiving themed things? Ah, darn. I was enjoying all of those fun desserts! Such a lovely season recipe. It looks like a great side dish. I always wondered whether the traditional Thanksgiving side dishes were just a product of the Northeast, where the winter squash and cranberries are ubiquitous. I love how you've updated this dish and made it a bit more universal. Hi Susan - I love the twist on the squash, and I am looking forward to seeing your other side dishes as well. Thanksgiving and Passover are my two favorite holidays to cook. Susan, your plan for the next four weeks is an absolute public service! Sure, there are plenty of resources for cooking turkeys, but interesting sides? Very cool. One tradition in our house is my wife Marion's delicious Sweet Potato Vichyssoise, a surprising, chilled first course. While I'm not dissing the turkey (I eat my share of that) I, too, am all the sides -- and I love this interpretation and presentation of acorn squash. Looking forward to your other side posts. You are so right...It is all about the side dishes. Always has been. Side dishes are definitely where the fun is since your creativity can run a little freer there without rattling the guests too much. This soudns like a tasty way to enjoy acorn squash...and those are probably my favorite of the winter squash! You always have the most amazing things cooking over here! This looks wonderfl! I can't get enough squash these days and know this would go over well here -- but not as a side dish. It truly sounds delicious. I sort of relieved that my in-laws leave the Frenchie out of Thanksgiving preps (well except for dessert :)) but I will be bringing this side dish anyhow!! Looks wonderful! I learn more about food traditionally served in celebration days in America or by American people. I'm definitely on the side of the veggies, and this looks brilliant. I've not tried this squash before, but will look out for it. Yup, yup, yup ... it IS all about the sides. As the lone winter squash lover in my abode, I keep looking for dishes that could convince my family how wonderful this food can be. I think I may have found a strong possibility with your recipe. I love acorn squash, anyway it's done! I like the lime on this dish, I bet it makes it very refreshing. I can't wait to see what other side dishes you show, because this one looks AMAZING!! Love the colours in your picture with the green skinned squash on the green plate! This sounds terrific - I may give it a try before Thanksgiving. We had acorn squash last Thanksgiving (I didn't make it) and really enjoyed it. Thanks for the great idea! I think pepitas are a very underused and underappreciated nut- I love them chopped in a rice pilaf, toasted and mixed with cumin-scented quinoa and sprinkled on yogurt or in oatmeal. Such a great nut! stacey-Mmmm... pistachios would be lovely. patricia-I love them in salads too. ivy-It really is delicious this time of year. lydia-Nope, it's the same here too. lorilynn-I'm looking forward to it as well. terry-"Public service." I like that. foodalogue-I'm so pleased you like it. mike-Mine too along with butternut. kristen-That's awfully kind of you to say. arfi-Thanksgiving is my favorite holiday here for amazing food. nic-It's very similar to butternut. jeanne-Why, you're practically an American then! ;) It was my pleasure. margot-Oh, that sounds terrific too. I've got to try that. kathy-I hope you like it! I am yet to be convinced that there is better squash out there than the butternut and kabocha. The pepitas are a nice touch. 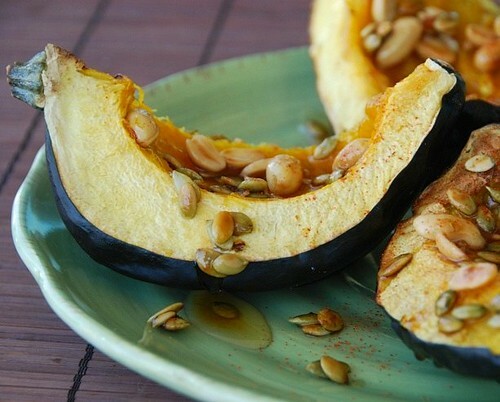 What a great idea to pair pepitas with roast squash! Acorn squash and I are still learning how to love each other... I look forward to trying out this recipe. I love the glaze idea! Susan, thanks so much for this recipe. I never know what to do with acorn squash, but this dish looks absolutely delicious! We are excited to have it included in this week's FoodieView Recipe Roundup! michele-That's so kind of you to say.